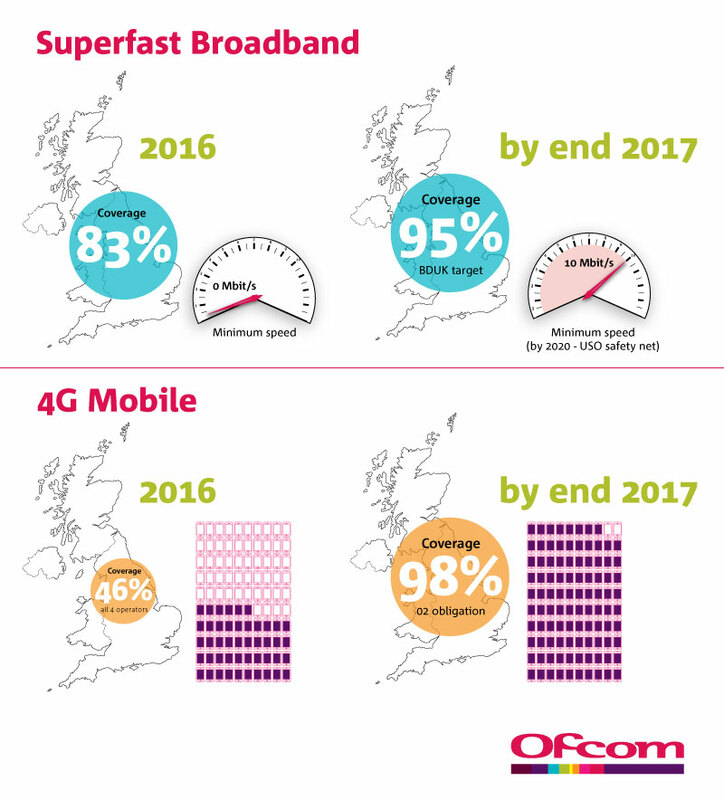 Ofcom has today set out how it plans to improve telecoms quality and coverage, so that UK consumers and businesses receive the best possible phone and broadband services. These are the initial conclusions from Ofcom’s Strategic Review of Digital Communications, announced last year, which is designed to make the UK a world-leading digital economy over the next decade and beyond. Many of these measures affect all major phone and broadband providers. Others relate specifically to Openreach, the division of BT that maintains the UK’s largest phone and broadband network on behalf of competing providers. A choice of networks for consumers and businesses. Openreach must open up its network of telegraph poles and underground tunnels to allow rivals to build their own, advanced fibre networks, connected directly to homes and offices. Reform of Openreach. Openreach needs to change, taking its own decisions on budget, investment and strategy, in consultation with the wider industry. Better quality of service across the telecoms industry. Ofcom intends to introduce tougher rules on faults, repairs and installations; transparent information on service quality; and automatic compensation for consumers when things go wrong. Better broadband and mobile coverage. Ofcom will work with the Government to deliver a new universal right to fast, affordable broadband for every household and business in the UK. We also intend to place new obligations in future spectrum licences to improve rural mobile coverage. Ofcom is today announcing a new strategy to promote large-scale roll-out of new ultrafast broadband networks, based on cable and fibre lines, as an alternative to the partly copper-based technologies currently being planned by BT. Supporting investment by rival providers will reduce the country’s reliance on Openreach, and increase competitive pressure on its network. To help bring this about, Openreach will be required to open up its telegraph poles and ‘ducts’ - the small, underground tunnels that carry telecoms lines. Using these, rival providers will be able to build their own fibre networks, connected directly to homes and offices. Openreach must make it much easier for competitors to access this network, and provide comprehensive data on the nature and location of its ducts and poles. This new ‘digital map’ of the UK will allow competing operators to invest, plan and lay advanced networks, giving people more choice over how they receive their phone and broadband services. Openreach is part of BT Group, but has obligations to treat all its customers equally. Ofcom introduced this structure in 2005, and it has delivered benefits such as stronger competition. However, the evidence from Ofcom’s review shows Openreach still has an incentive to make decisions in the interests of BT, rather than BT’s competitors, which can lead to competition problems. For example, Openreach’s governance lacks independence from BT Group. The wider company has retained control over Openreach’s decision-making and the budget that is spent on the network, and other telecoms companies have not been consulted sufficiently on investment plans that affect them. For these reasons, Ofcom has decided it is necessary to overhaul Openreach’s governance and strengthen its independence from BT. In future, Openreach needs to take its own decisions on budget, investment and strategy - such as the deployment of new networks. Openreach management should be required to serve all wholesale customers equally, and consult them on its investment plans. There will also be greater transparency over how costs and assets are allocated between Openreach and the rest of BT. Ofcom will prepare detailed proposals later this year to implement these changes. The new model might require Openreach to become a ring-fenced, ‘wholly-owned subsidiary’ of BT Group, with its own purpose and board members. If necessary, Ofcom reserves the right to require BT to spin off Openreach as an entirely separate legal entity, with its own shareholders. Ofcom intends to introduce a range of measures designed to ensure that all phone and broadband companies provide the quality of service that customers expect. First, Openreach will be subject to tougher, minimum requirements to repair faults and install new lines more quickly. These will build on measures introduced by Ofcom in 2014, but will set higher minimum standards and extend to other aspects of performance, such as how often faults occur. Second, Ofcom will introduce performance tables on quality of service, identifying the best and worst operators on a range of performance measures so that customers can shop around with confidence. Third, Ofcom intends to introduce automatic compensation for consumers and businesses when things go wrong. Broadband, landline and mobile customers will no longer have to seek redress themselves, but will instead receive refunds automatically for any loss or reduction of service. Coverage of broadband and mobile services is increasing fast. More than eight in ten UK premises can now receive superfast broadband, and this is expected to reach 95% next year. Under Ofcom rules, 98% of homes and offices must receive an indoor 4G mobile signal by next year. However, Ofcom remains concerned about those who cannot receive an acceptable service. We will work with the Government to deliver the new universal right to fast, affordable broadband for every household and business in the UK. We also intend to place new obligations in future spectrum licences to improve rural mobile coverage. Ofcom will also ensure that consumers have accurate and easy-to-use coverage information, to help them choose the best provider. This will place further pressure on mobile network operators to improve coverage. Last year, Ofcom launched a comprehensive map of mobile coverage by postcode for the whole UK. This will soon be updated to include broadband coverage, and we intend later to offer data for individual addresses. Ofcom will soon consult on plans to make it easier for mobile customers to switch provider, to help increase competition in the market. Sharon White, Ofcom Chief Executive, said: “People across the UK today need affordable, reliable phone and broadband services. Coverage and quality are improving, but not fast enough to meet the growing expectations of consumers and businesses. “So today we’ve announced fundamental reform of the telecoms market - more competition, a new structure for Openreach, tougher performance targets, and a range of measures to boost service quality. publish the first performance tables for quality of service. Welsh Ministers today appointed David Jones as the first Ofcom Board Member for Wales.